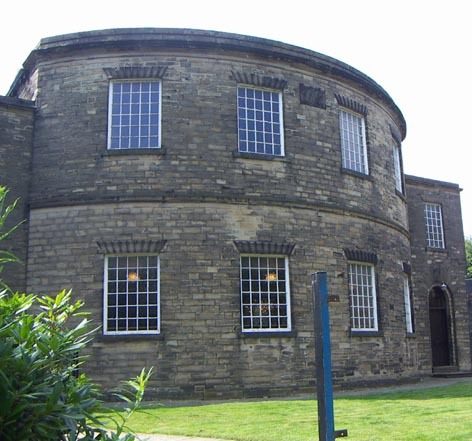 It’s called the pork pie chapel because of its rounded front. 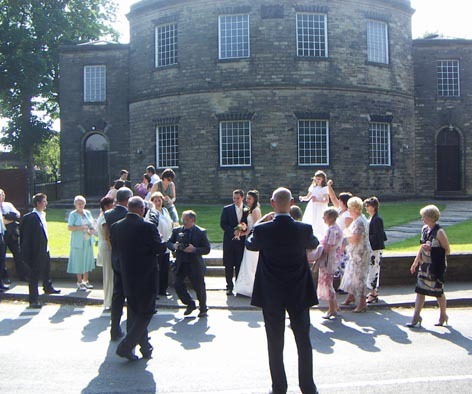 Really it’s Gomeral Methodist Church, and friends of ours got married there on Saturday. It’s a lovely place and it was a lovely wedding. 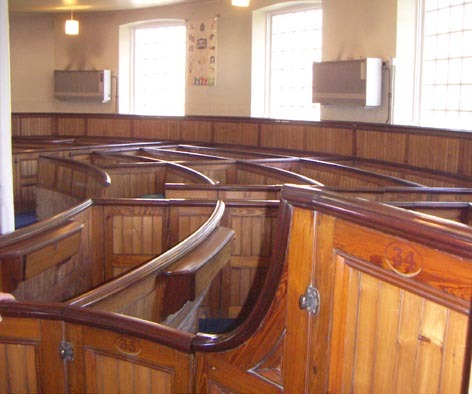 All the pews are the boxed kind, with little doors. As I was admiring them, before the service, the minister said: “Oh, but they’re not original.” Just as I was about to enquire who made such wonderful reproductions, the steward added: “They were put in in 1904.” Not that modern then. 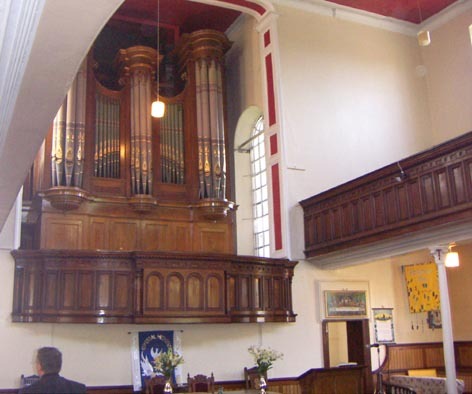 The organ loft is still there, although the organ itself has been moved down onto ground level. See the balcony? Now that is still there, in its totally orginal state. 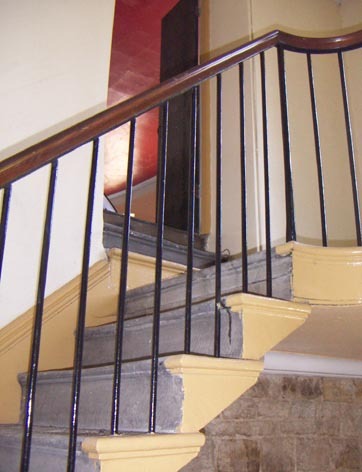 Lovely stone steps leading up there. 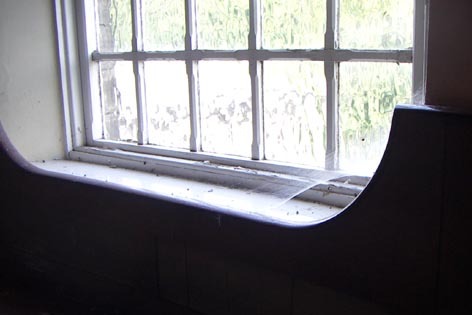 But due to the shrinking congregation it’s not used any more, and not cleaned, so is thick with dust and cobwebs. 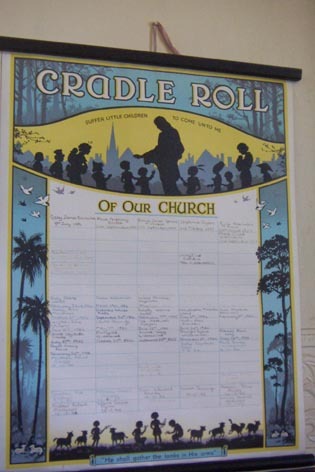 They even stil do the same Cradle Roll as used to be up in the Sunday School I attended, 30 odd years ago. The bridal party arrive, and chat to the minister. That’s m’husband in the blue shirt, who was also official photographer. We all trooped in and sang ‘Give me Joy in My Heart’ and later the Welsh hymn ‘Guide me, O though great Jehovah’. That’s the one where you get to sing ‘Bread of Heaven, Bread of Heaven, Feed me till I want no more’. I cannot put the magnificence of it into words, but it’s a great thing to sing. Unfortunately I was somewhat hampered as I was wearing my contact lenses, which I haven’t worn for going on for a year, so my eyes were grumbling. Also I think my prescription has changed considerably since I bought them, so what with longsightedness kicking in plus watery eyes I struggled to read the words. I was okay with the tune, except it falls in an awkward register for me. For the first two verses I sang soprano, then tried my natural contralto for the third. This didn’t work however, so I warbled up and down and all over the scale. Note to self, stick to soprano when it comes to the Bread of Heaven hymn. 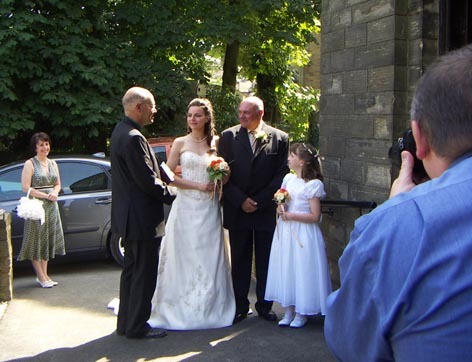 Here’s m’husband again, directing the bride and groom into the most photogenic poses as they leave the chapel. 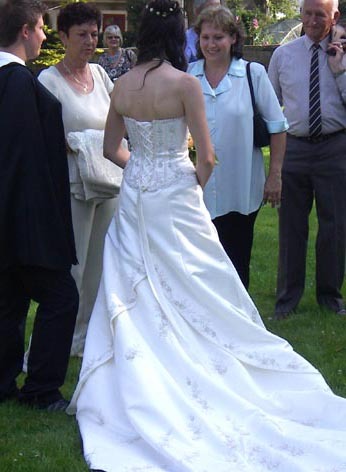 The bride chats to her family while I admire the back of her dress. The bride tries to keep the best man calm. 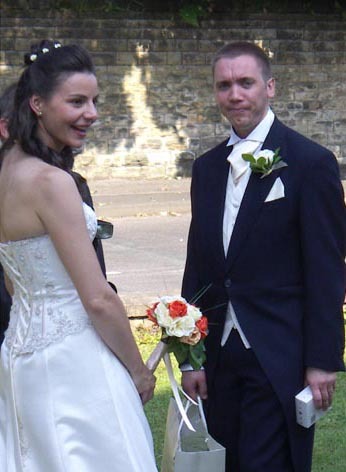 He was infinitely more nervous than the groom, and got worse as it came closer and closer to the time he would have to make his speech. 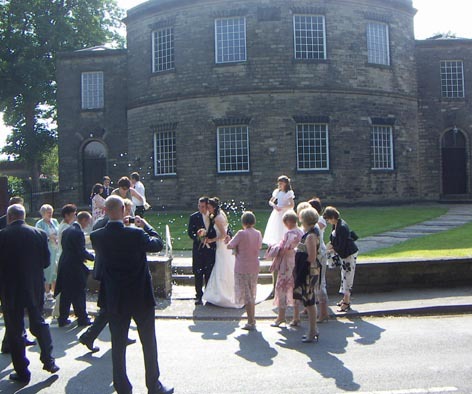 Photos over, everyone gathers on the road outside the chapel ready for the confetti. M’husband’s got them poised and you can just see him hurrying off in the opposite direction for his final shot. One, two, three – go confetti!